8 As-tu des frères et des soeurs? 15 Quelle est la date aujourd'hui? Hide and seek: Amélie counts up to 30. From previous sections, you are already familiar with the numbers 1-12 and the months of the year. Learning the numbers 13-31 will now enable you to talk about dates, such as when youir birthday is. You can also embark on a wider range of mathematical activities, paving the way towards using French when telling the time, calculating with money, and measuring weight, length and speed (see Pack 2, "Où habites-tu?"). 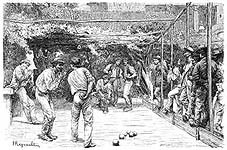 In games, such as Boules, a.k.a. 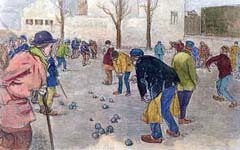 "Pétanque" you can also use French numbers to talk about scores, and measuring whose ball is nearer the "cochonnet". 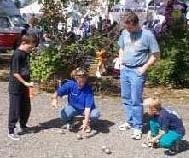 Why not have a go playing Pétanque - in French, of course! Click on the right to download a 1-sheet handout on "The Simple Rules of Boules". Previously in section 5 (Colours) we introduced a simple version of "beach boules" - a game played between individuals which gives opportunities to talk about 'colours'. Playing the full game involves talking about measurements as you work out which team has the closest boule to the "cochonnet", and counting up points as you work out the score.